The Barna Group’s research discovered that 20% of practicing Christians believe that their meaning and purpose are based only on “earning as much as possible so you can make the most of life.” God wants more for us. Yesterday, we discussed that only 8 million people have a biblical worldview at work. That leaves 147 million working without the timeless wisdom of God. But why should these 147 million care? One reason is because God’s Word will give them true purpose in their work. 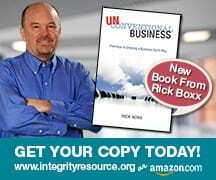 Unconventional Business Leaders point others to their God given purpose and the hope that only comes from Christ Jesus.